Give your child the gift of our unique nature immersion summer camps this year! Lead by professional teachers on the land at TLC Farm and in the surrounding forest of Tryon Creek State Park, each day children participate in nature-based crafts and empowering activities such as gardening, food harvesting & preservation, herbal medicine making and more. There is time each day to visit the goats and chickens, explore the forest, hear stories and sing songs. Both weeks of camp are Tuesday through Friday from 9:30am to 2:30pm, are open to 3-7 year olds, and cost $235. We provide a nutritious, organic snack each day and campers bring a lunch. To register, email Isobel@WillowCreekForestSchool.org. Visit our website for more information. Each day of camp will focus on a different element - Earth, Air, Water and Fire. Children will have the opportunity to connect with each of these elements through nature-based crafts, stories, and songs. 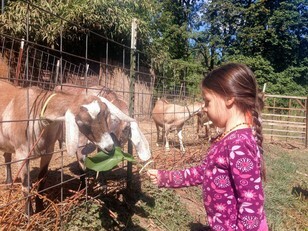 Each day also includes an organic snack, time visiting the chickens and goats, forest exploration time and free play. This week we focus on getting colorful! We will experiment with natural dyes, making rainbows and other nature-based color crafts accompanied by stories and songs. Each day also includes an organic snack, time visiting the chickens and goats, and forest play.